One of the problems with using CppUnit as the unit test framwork in C++ is that adding a single test requires updating the code in two files and in total 3 places. A declaration in the header file, a macro in the header file to regsiter the test and the test itself. This makes adding a test too hard, which means the tests themselves become too big because it is easier to add extra asserts to an existing test than to add a new test. Some of the newer C++ frameworks overcome this, but we have been using CppUnit for a long time and have a lot of tests already written so I do not really want to change frameworks. and the declaration and prototype are created. I don't need to even look at the header file I can just go straight to the definition of the test function and add the test. The script is very simple, it searches for the last CPPUNIT_TEST macro in the header and adds a macro for the new test case. Searchs for the last test function, and adds a test after that. Then it adds a defintion at the end of the source file. The test class already has at least one test function when the script is run. Since I use a separate script to generate the boilerplate test class with a single test this is always true in my case. We use CruiseControl to run automatic builds after every commit and I thought it would be nice to monitor the build status from within QtCreator. I also wanted to try creating a simple QtCreator plugin to see how easy it would be to extend it. 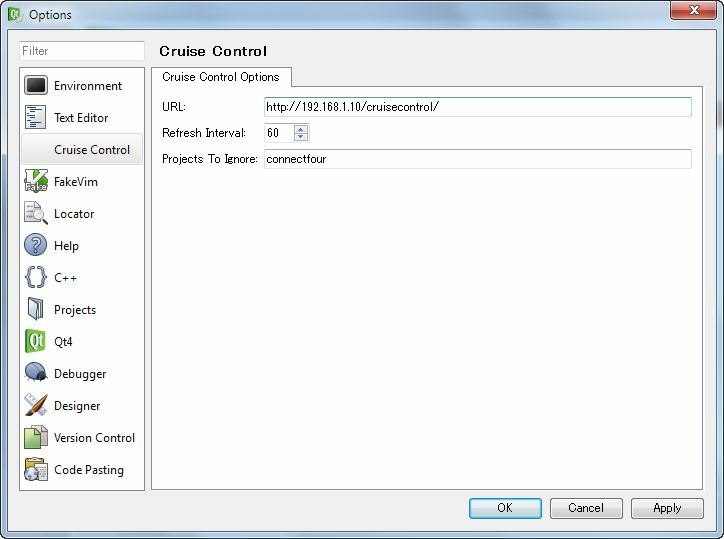 I already use the Firefox add-on to monitor CruiseControl which does all that I need for a monitor so I just wanted to port that to work in QtCreator. The plugin adds a red/green icon in the left hand bar to indicate the build status and a tooltip to show the status of individual builds. The tutorial from VCreateLogic was very helpful setting up a basic plugin. This tutorial describes how to set up a project, how to add menu items or new settings. So the basic configuration was straightforward. The Welcome plugin which is part of QtCreator has a class for getting rss feeds. This formed the base for getting the data from the CruiseControl server. The main change required was an update to how the xml is parsed. Also, my first version worked fine when getting data from a test file but would not get data from the server. The original does not set the port, since I assume all normal rss feeds use the default port 80, but our CruiseControl server does not use port 80. Once discovered this was trivial to fix. The hardest part was finding out how to add the display widgets to the left hand bar in QtCreator. A bit of poking around found a modemanager which manages the widgets. That seems to work but I am worried about API changes in future versions since there seems to be no official documentation for the API. At the moment only the monitoring function is implemented. Hopefully I will be able to find time to add functions to restart or stop builds from a context menu. QtCreator is a powerful integrated development environment from Nokia for creating applications with C++ and Nokia’s Qt Framework. It is available on all the desktop platforms supported by Qt (Windows, Linux and Mac). QtCreator can be used with either gcc or the Microsoft C++ compiler on Windows and the integrated debugger uses gdb or cdb depending on the compiler. 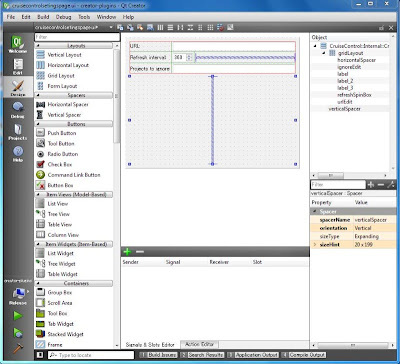 When QtCreator was released there were quite a few comments asking why another IDE was needed; why not just use VisualStudio, it is powerful mature and the `industry standard.’ Having tried to use Visual Studio in the past and now having used QtCreator for a couple of months the answer is clear. If you are doing development with Qt then QtCreator is a much better environment. This is principally because it is tailored specifically to Qt development so supports Qt directly and is not encumbered by masses of features which are not needed for C++ development. • Supports Qt project files so you don’t have to struggle with two different project management systems. • Has Qt Designer embedded directly into the IDE. • Good support for source control systems. • Built in help for Qt. The multiplatform nature of Qt is a big advantage for me. I now have identical development environments on both Windows and Linux, so switching between them is easy. If there is a bug which only shows up on the Windows version I can easily debug it on Windows, then switch back to Linux to run valgrind. One of the features I really like in QtCreator is the locator bar. Opening files in an IDE has always been an issue for me. The file open dialog is so slow, and having to search through a large tree of files also takes forever. I like to be able to just type the name of the file, preferably with some form of auto-completion. With QtCreator this is possible. Ctrl-K takes you to the multi-function locator bar then just typing the name of the file will show a list of matches, hit enter and the file opens in the editor. It takes just a couple of seconds to open any file in the project, without having to take your hands off the keyboard. The code navigation and search function is also very well done. There are function keys for header-source switching and for following symbols to definitions. One of the more useful functions is “Find usages” which searches the code model for uses of a particular function. The searches based on the code model are almost instantaneous even with a large project. There is also a multi-file full text search which is a bit slower. The code editor has all the features you would expect, syntax highlighting, code folding and auto-completion. It is quite similar to Kate, which I used for a long time. The only thing I miss is the block selection mode. 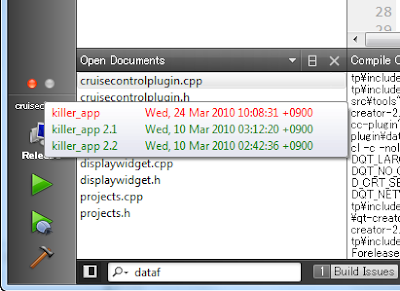 However, QtCreator is not as mature as some of the other IDEs, being much newer and does have some inconveniences. Starting the debugger with a large program seems slow, much slower than VisualStudio for the same executable. So far this has not been a big problem for me as I don’t use the debugger a great deal. When a large project is loaded QtCreator seems to use lots of memory. If this gets swapped out due to some other operation on the machine then switching back to QtCreator can take several seconds with the interface stops responding for some time. This happens on both Windows and Linux. • There is no support for “code snippets” – the source directory has a “dead” plugin and version 2.0 has some code-paster support based on shared files. But it is likely that these will be improved in the future. Also, QtCreator supports plugins for extending the functionality. In fact most of the built-in functions are actually implemented via plugins. So far I have not found many 3rd party plugins but I would expect more to appear. I have not been a big fan of IDEs. Several times I tried to get used to Visual Studio but always found it big, slow and not suited to the way I work. For a long time my development environment on Linux consisted of multiple instances of Kate (a KDE text editor) each on a different desktop and several small scripts. I would have source files in one editor and headers in another, so when working on a single class a simple keystroke to switch desktops would also switch header and source files. An “edit” script would open the file in the right text editor from the command line – I don’t think I ever used the file open dialog to open a file. Searching across multiple files was done using the GNU id-tools; very fast and easy to filter the output. As others have said, UNIX is the IDE. would add three new functions and their declarations to the test class. So basically, I was happy with my development environment. But there were two problems. I also have to develop on Windows and even with cygwin the environment there always seemed slower and I had to use a different editor. Secondly, all my colleagues use Windows with Visual Studio. I see them struggling with basic tasks; they ask for my help on some coding problem so I suggest that they open a particular file and 2 minutes later they are still faffing around clicking through directories in a file open dialog. The majority of this problem is probably their knowledge of the environment rather than a problem with VS itself. But, Visual Studio does have some significant problems for our C++ development. 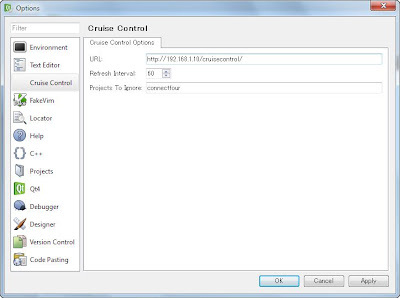 We use Qt, which has its own project management system. 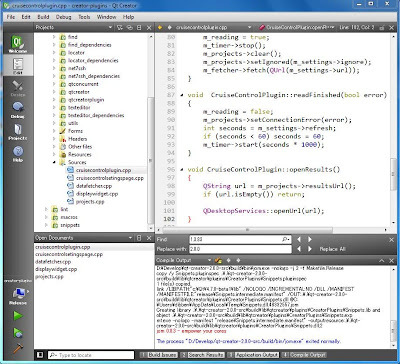 The project is defined in .pro files which are then converted into makefiles by qmake. Visual Studio project files (vproj) files can also be made by qmake, so when a project is updated, the visual studio build files need to updated and then re-loaded. This means we don’t use Visual Studio’s project management functions. Even if we didn’t have this restriction I don’t like vproj files anyway because they are hard to manage in a version control system because they are difficult to merge. The second problem with Visual Studio is that it has no specific support for unit tests. As a senior developer in the group I have some responsibility for the tools that the other developers use. They want to use a nice graphical IDE – because it is easier. But I see all sorts of productivity problems in the way that they use it. We have a large code base, use Qt for the GUI and VisualStudio does not seem to handle this well at all. So what I wanted was a development environment suited to large C++ Qt applications where I could use the same tools on Windows and Linux. It should have enough graphical features to not frighten the junior developers used to their cozy WIMP world but should have enough keyboard shortcuts to allow efficient development and be customizable for our specific requirements. 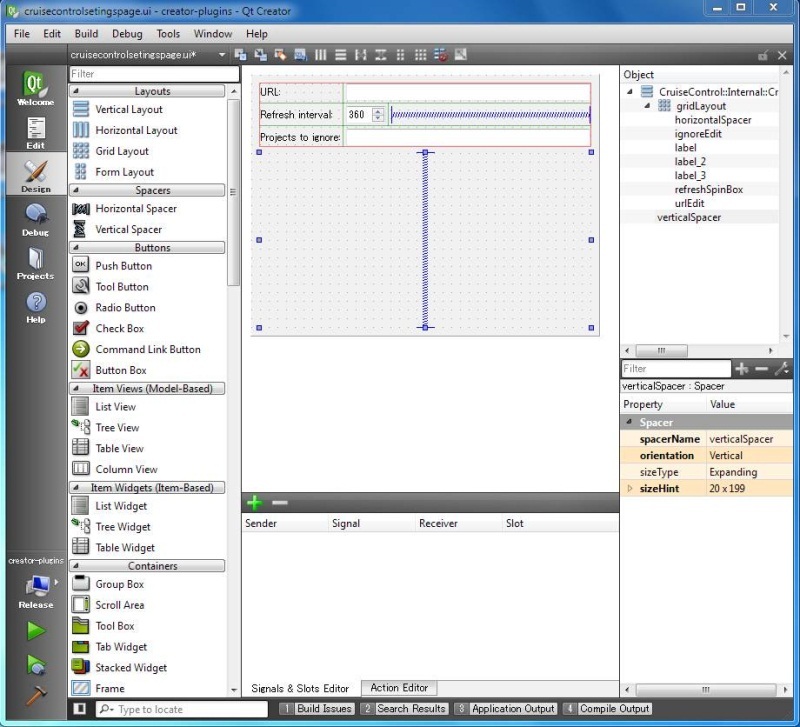 Then Trolltech released Qt-Creator. While clearly not as comprehensive as Visual Studio, it is specifically targeted at the type of development that we are doing. I have now switched to Qt-Creator and the next post will be on my experiences so far.